4x6 Custom Magnets - Outdoor & Car Magnets 55 Mil Round Corners are great choice for marketers trying to build a good brand image. 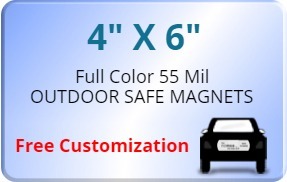 They can get these outdoor safe magnets to place on cars and any metal surface in the outdoors where there is high visibility. The high thickness makes these Custom Square and Rectangle Magnets impossible to move with the movement and speed of the vehicles. Round corners on the other hand eliminate the chance of peeling off early. Order these custom magnets right now to exploit our free design, lowest price guarantee and free shipping in the Contiguous USA. Request a quote to know savings that you can pocket on bulk ordering these 4x6 Custom Magnets - Outdoor & Car Magnets 55 Mil Round Corners.